If there was any life left in this climate change scare story, this latest research should finally see it off. Clathrate (hydrate) gun hypothesis stirred quite the controversy when it was posed in 2003, as ScienceDaily reports. 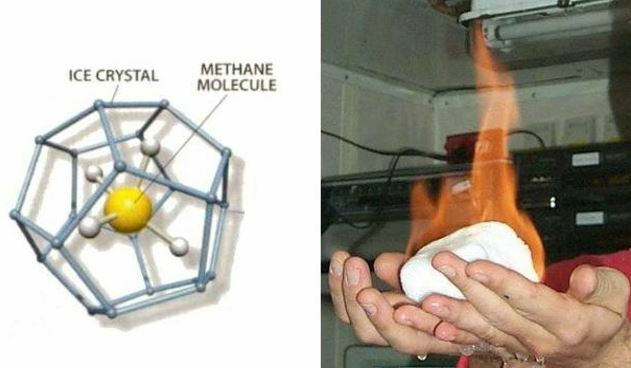 It stated that methane hydrates — frozen water cages containing methane gas found below the ocean floor — can melt due to increasing ocean temperatures. According to the hypothesis this melt can happen in a time span of a human life, dissociating vast amounts of hydrate and releasing methane into the atmosphere. Consequently, this would lead to a runaway process, where the methane released would add to the global budget of greenhouse gases, and further accelerate the warming of the planet. This dramatic hypothesis inspired science fiction and scientists alike, spurring the latter to further investigate the sensitivity of hydrates. A new study in Nature Communications has thus found that the hydrate gun hypothesis seems increasingly unlikely, at least for a specific site in the Arctic Ocean that is highly susceptible to warming. “Short term temperature warming has limited impact on the gas hydrate stability. We show that warming can significantly affect gas hydrates in the seabed only when ocean temperature is constantly rising for several centuries,” says the lead author of the study Dr. Wei-Li Hong of CAGE and currently Geological Survey of Norway. Hong and colleagues reported on an increase of methane flux beneath large mounds of hydrates in an area called Storfjordrenna, in the Barents Sea close to Svalbard. These gas hydrate pingos are all profusely seeping methane.But according to Hong, even though the area is shallow, and potentially susceptible to temperature change, these seeps are not intensifying because of the momentary warming. “The increase of methane flux started several hundreds to thousands of years ago, which is well before any onset of warming in the Arctic Ocean that others have speculated,” says Hong. The study was based on measurements of pore water chemistry in the sediments from the area. Pore water is water trapped in pores in soil, and can be analysed to reveal environmental changes in a given area through time. Scientists also analysed authigenic carbonate, a type of rock created through a chemical process in areas of methane release, as well as measured bottom water temperatures. Data from these analyses was then used in a model experiment. Didn’t we have a few centuries of increasing temperature early in the Holocene? Where was the runaway warming then? Michael Crichton: “Sit down at a dinner party, and you say: The world is coming to an end—we have the most horrible things [imminent], and you immediately get the aroused attention at the table. Alternatively, you say, you know what? Basically everything’s good. The world’s getting better. Mind you, breaking up clathrates made up for a good yarn in John Barnes’ “Mother of Storms”! 2) The so-called atmospheric “greenhouse effect” is NOT caused by “greenhouse” gases anyway, so whether methane hydrates melt or not, it doesn’t really matter for Earth’s climate!